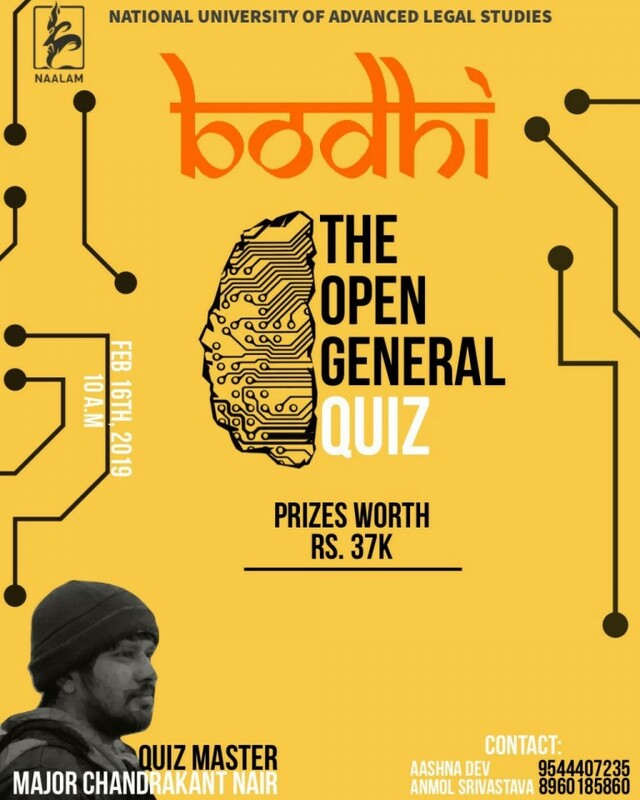 The National University of Advanced Legal Studies, Kochi is organising an open general quiz “BODHI” to be conducted as a part of our annual literary, cultural and sports fest – NAALAM 2019 on the 16th of February 2019. 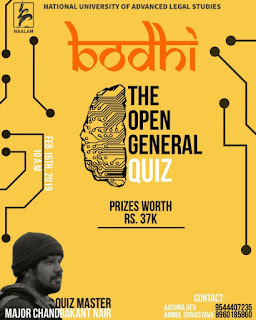 The quiz is open to both individuals and teams. The team can comprise of either two or three members. There are exciting cash prizes worth 37K and other goodies awaiting the winners. A team can consist of a maximum of 3 members. Lone wolves are permitted. There will be a preliminary round followed by the finals. Top 8 teams from the prelims will qualify to the finals. Any number of teams from an institution are allowed. Registration for the event will be separate and the registration fee per team is Rs 150. Participants must produce a valid ID card during registration. The rules of the quiz and its format for each round will be explained by the quiz master on the day of the event, prior to the round. All decisions of the quiz master shall be final and binding.